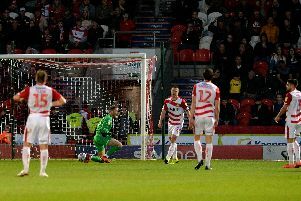 Doncaster Rovers might sit top of League Two but if they carry on in this vein there will be plenty more twists and turns to come. A game of two halves saw Rovers firstly demonstrate a ruthless attacking prowess with a stunning three-goal blitz inside 11 minutes. There is a strong belief in the Doncaster dressing room that when they click they have the armoury to blow teams away in this division - and Stevenage felt the full force of that following quickfire goals from Andy Butler, Liam Mandeville and Matty Blair. Rovers ultimately collected their fourth straight win at the Lamex Stadium and, importantly, maintained a positive momentum going into this weekend’s trip to fellow high flyers Plymouth Argyle. Job done. Because the second half saw the re-emergence of a team still capable of caving in - just like they did at Blackpool and Luton. Only this time they got away with it. After a largely uneventful 28 minutes, Butler headed in the opener from James Coppinger’s free kick. Tommy Rowe then did excellently to tee up in-form Mandeville for his sixth goal in six games before Matty Blair’s sublime volley from the edge of the box ought to have put Boro out of sight. Had Rovers then gone onto see the game out that would have been some statement of their promotion credentials. But, whether it was down to Darren Ferguson’s men switching off, or Stevenage not having anything to lose, or a combination of the two, Rovers completely lost their grip on the game and in the end were left anxiously clinging on. Boro began the second period on the front foot and got their reward when substitute Tom Pett drilled past Marko Marosi. Fraser Franks then further reduced the deficite with a stunning chest and volley. Crucially, John Marquis immediately headed home another Coppinger free-kick to ease the pressure. But Rowan Liburd’s 90th-minute tap-in set up a grandstand finish during which Pett came within inches of curling home an equaliser. Rovers went top of the table as a result, but they missed an opportunity to make a very powerful statement. At 2-0, Charlie Lee’s downward header from a free-kick was kept out by a combination of post and Marosi. It looked perilously close to going over the line. Had that gone in it would have been a very different game and possibly a very different outcome. There was a momemt towards the end of the game when Rovers broke and had a three on two - and Jordan Houghton just gifted the ball back to Stevenage with a sloppy pass. That was symptomatic of a really poor second-half display during which Doncaster lost control in midfield and were just not good enough at holding on to the ball. No team in England has scored more goals than Rovers (42). Yet only five other teams in League Two have conceded more than them (28). There’s a long way to go yet in the promotion race - and the chances are it won’t be dull!